BY DR. KEVAN L. MAIN eafood, primarily fsh, is by far the world's most important source of animal protein and is the principal protein source for nearly one billion people on the planet. Population biologists estimate that without rapid growth in seafood supply, the human population will reach the carrying capacity of the earth (the ability to grow enough food on land) by the year 2050. Yet the amount of seafood harvested from wildcaught fsheries has been static for more than 25 years. At the same time, the demand for seafood resources has increased around the world, to maintain per capita seafood consumption. Ultimately, this means the need to expand aquaculture production—the farming of fsh and other aquatic species—is one of the world's most pressing food problems. 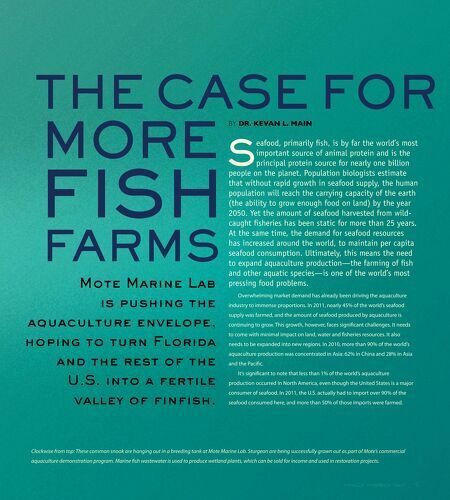 S Mote Marine Lab is pushing the aquaculture envelope, hoping to turn Florida and the rest of the U.S. into a fertile valley of finfish. Overwhelming market demand has already been driving the aquaculture industry to immense proportions. In 2011, nearly 45% of the world's seafood supply was farmed, and the amount of seafood produced by aquaculture is continuing to grow. This growth, however, faces significant challenges. It needs to come with minimal impact on land, water and fisheries resources. It also needs to be expanded into new regions. In 2010, more than 90% of the world's aquaculture production was concentrated in Asia: 62% in China and 28% in Asia and the Pacific. It's significant to note that less than 1% of the world's aquaculture production occurred in North America, even though the United States is a major consumer of seafood. In 2011, the U.S. actually had to import over 90% of the seafood consumed here, and more than 50% of those imports were farmed. Clockwise from top: These common snook are hanging out in a breeding tank at Mote Marine Lab. Sturgeon are being successfully grown out as part of Mote's commercial aquaculture demonstration program. 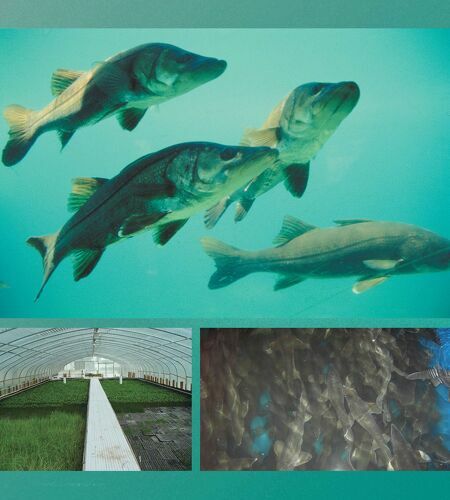 Marine fish wastewater is used to produce wetland plants, which can be sold for income and used in restoration projects.